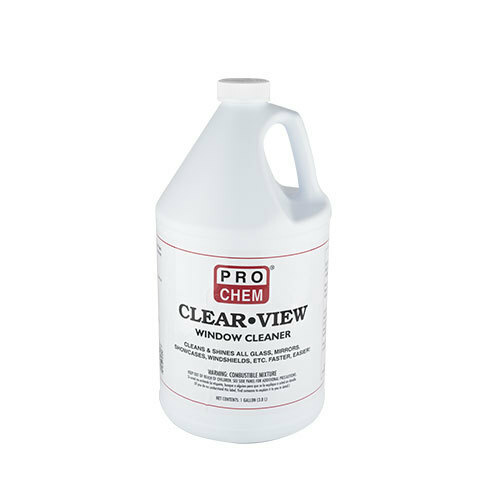 CLEAR VIEW | Pro Chem, Inc.
CLEAR VIEW is a crystal clear, blue, ready-to-use, professional-strength glass cleaner that has the power to cut through grease and grime without leaving streaks. A simple spray application followed by a dry wiping cloth or squeegee leaves windows sparkling clean. There is no film left behind to catch dirt and dust; therefore, the glass stays clean for a longer period of time. Spray on desired cleaning area and rinse with cloth or squeegee. Not safe for use in windshield washer reservoir. Repeated overspray will harm vehicles clear coat.